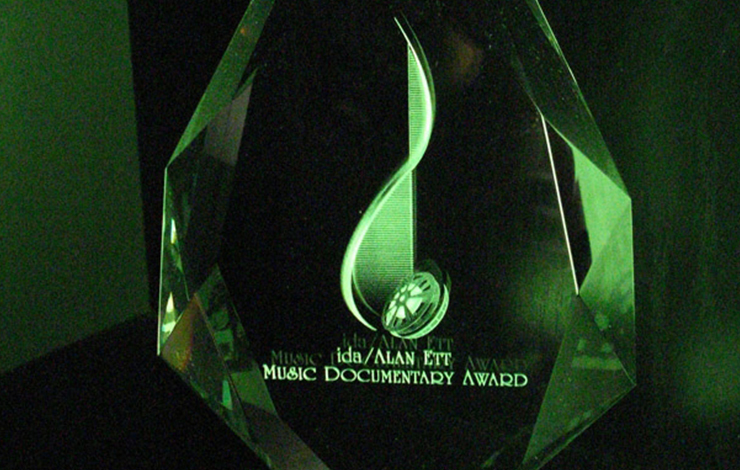 There's a new award this year, courtesy of musician/composer/businessman--and IDA Trustee--Alan Ett: the IDA/Alan Ett Music Documentary Award. The award will be given to an "outstanding documentary about music and/or one illustrating exemplary creativity in the use of music in a documentary." Ett's professional background in music dates back to the 1970s, when he taught at the Boston-based Berklee School of Music and earned his masters in composition from the New England Conservatory. He spent the late '70s and early '80s performing and teaching throughout Western Europe. In 1984 he landed in Los Angeles, and seemingly took a radical turn from music, venturing into the computer industry. "When I first came back to the US, I thought that LA would be waiting for me, given my stature in the world-not!!!" he reflects via e-mail. "So, I was interested in computers and met a company called Alpha Omega computers, whose claim to fame, for a fleeting second, was that we created a 20 MB hard drive that could be moved while it was running. What that did for my area of interest and focus was allow me to meet people of like interest at a time when all of this was only beginning to develop. I went to the first SIGGRAPHs, met the folks developing the first PC-based movie-budgeting software, Movie Magic, and became involved with Roland Corporation on the development of the first PC-based MIDI sequencing software, MPS or Music Processing System. I was also going around to production companies, ad agencies and music companies with a luggable Compaq computer and demonstrating all of this software, which helped establish relationships that have survived to this day with many of the luminaries in those industries." Ett established the Alan Ett Creative Group in 1991. The Group, a conglomerate of companies providing a wide range of services and products related to music, sound and media production, dovetailed his passion and early career in music with his expertise in computer software. "The goals of the company at the beginning were the same as they are now," he explains. "We want to have the commitment to craft and art as well as the facility with technology to deliver the highest quality product to whatever project we are working on. We promote from within, nurture talent, and have a deeply etched artistic ethic that will hopefully contribute positively to the development of our culture and society." And Ett continues to compose for film and television, while running his business. He says, however, that he hasn't necessarily been inspired by specific film composers or films. "I am sensitive to the musical score as it accompanies every aspect of our existence," he maintains. "I spent a lot of my life on stage and have an acute awareness of how music can move people. Finding the right sound for a scene is very similar to finding just the right music to accompany a dinner--which also must be supported by the right food, wine, lighting, setting, etc."